Nice townhome with 2 bedrooms, 2 baths and nicely updated kitchen. Located in a great community! 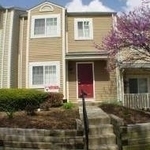 Close to shopping and within walking distance to public transportation.